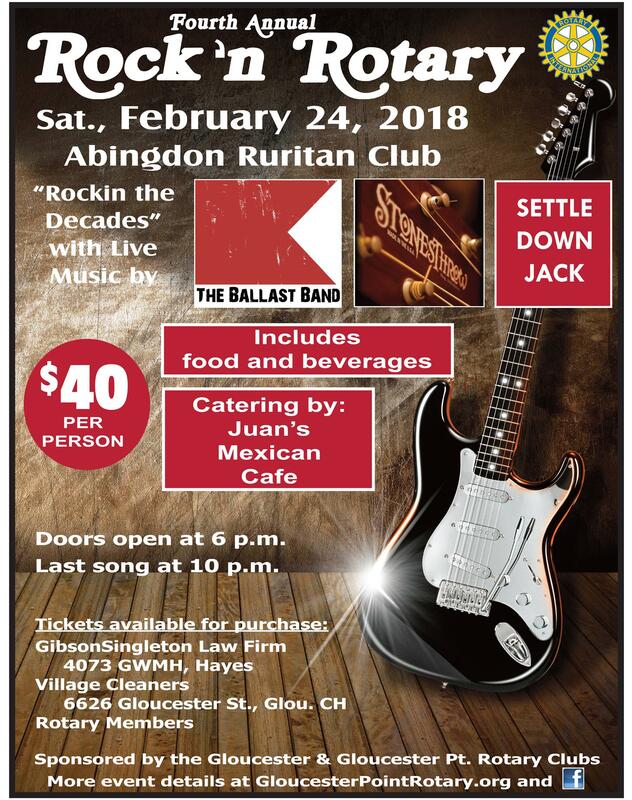 We are pleased to announce that the 4th Annual Rock'n Rotary fundraising event has been scheduled for February 24, 2018, from 6:00-10:00 p.m. at the Abingdon Ruritan Club. Tickets are on sale now for $40.00 each. Admission includes a delicious dinner catered by Juan's Mexican Cafe, complimentary adult beverages, and live music by The Ballast Band, Stones Throw, and Settle Down Jack. Tickets may be purchase online at our Facebook site, at GibsonSingleton Virginia Injury Attorneys, and The Village Cleaners. Rotary members also have tickets for sale. See you there!